In order to set the late planting cutoff date, we review information generated from agronomic research relating planting date to corn yields at the farm-level. We begin with information presented by Professor Emerson Nafziger in this March 23, 2017 article. It is typical of the information generated from agronomic research relating planting date to corn yields. The yield response curve in that article is based on an average of central and northern Illinois sites over 2007 through 2016. Professor Nafziger kindly provided the data in the form of yield penalty by planting date in Table 1. The yield loss in Illinois is minimized (optimal planting window) by planting in mid- to late April. The yield penalties become increasingly large as planting is delayed after mid-May. For example, planting on or after May 20 resulted in a yield loss of 8.6 percent, or 18 bushels per acre. See the farmdoc daily article of May 20, 2015 for further discussion of the response of yields to planting date in Illinois. Results from corn planting date research for different years and different locations throughout the Corn Belt vary, but the reported pattern of yield response to planting date is comparable to those presented by Nafziger. Examples of other recent research in this regard include Abendroth et al. (2017) and Long et al. (2017). We have previously defined the beginning date for substantial late planting penalties on corn yield in the U.S. to be May 20 (e.g., Irwin, Good, and Tannura, 2009). One can certainly argue for an earlier cutoff date, e.g., May 10, in the heart of the Corn Belt based on the data in Table 1 and other similar studies. However, we continue to opt for the May 20 date in light of the increasing corn acreage in the northwestern part of the Corn Belt and the later date of the optimal planting windows in these areas (Long et al., 2017). Figure 1 shows the percentage of corn planted late in the U.S. over 1980-2017 based on the May 20 cutoff date from 1986-2017 and a May 30 cutoff from 1980 through 1985. The change in cutoff dates in the mid-1980s reflects recommendations for earlier planting that appeared around that time. On average, late planting based on this measure was 18 percent, with the bulk of the observations between about 10 and 30 percent. 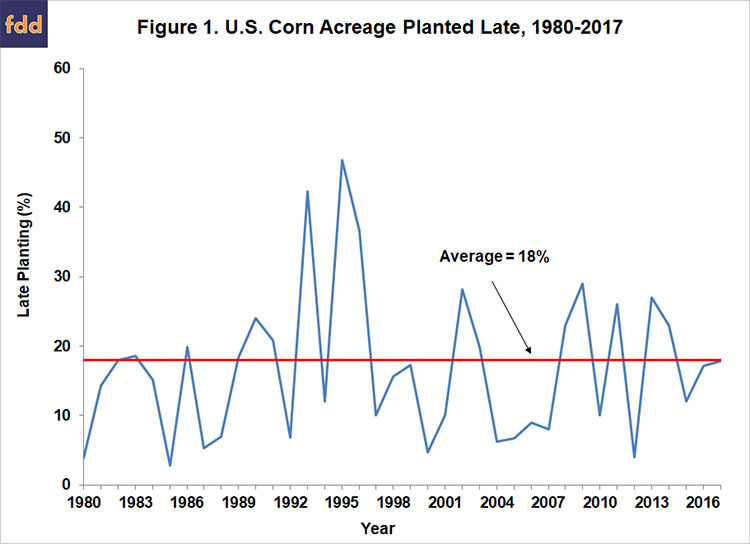 There is no evidence of a trend up or down over time in the late planting percentage, which suggests that producer behavior in aggregate with respect to late planting has been surprisingly stable. The third factor that will determine prospects for timely planting of the U.S. corn crop is the minimum number of days required to plant the U.S. corn crop. Note that this is simply stating the planting rate in terms of days rather than acres or percentage of the total planted acreage. We estimated the minimum number of days required to plant the U.S. corn crop in a farmdoc daily article last week (April 19, 2018). We found that producers in Illinois, Indiana, and Iowa needed a minimum of 14 suitable field days, or two weeks, to plant the corn crop based on maximum daily rates of historical planting progress. Assuming the three states are representative of the entire Corn Belt, 14 days can also be used as an estimate of the minimum number of suitable field days needed to plant the entire U.S. corn crop. It is important to emphasize that this is the absolute minimum number of days required to plant the crop because it assumes that peak rates of planting progress can be maintained for all 14 days. The fourth factor that will determine prospects for timely planting of the U.S. corn crop is the total number of days suitable for planting before the cutoff date for a significant late planting yield penalty, which we assume is May 20. If we begin counting on April 25, this means there is a total of 25 days until the May 20 cutoff date is hit. We need to know the historical distribution of suitable field days over this 25-day period in order to determine the likelihood of obtaining different numbers of planting days. 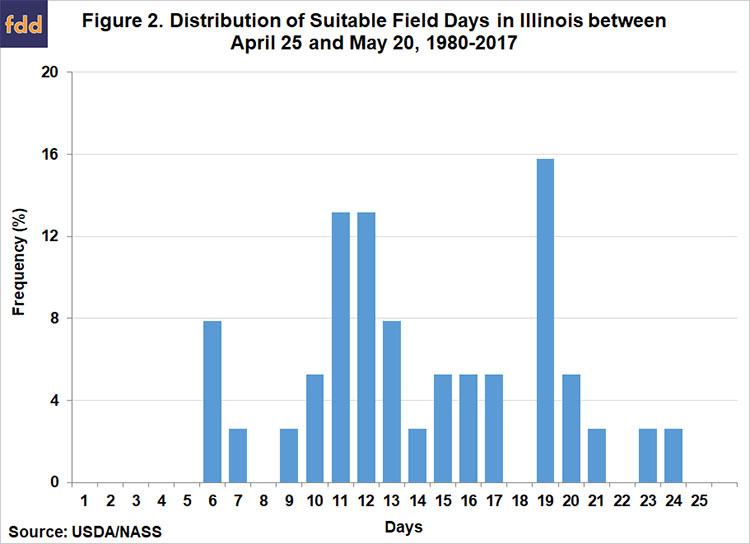 Figures 2-4 show the distribution of suitable field days between April 25 and May 20 over 1980-2017 in Illinois, Indiana, and Iowa, respectively. 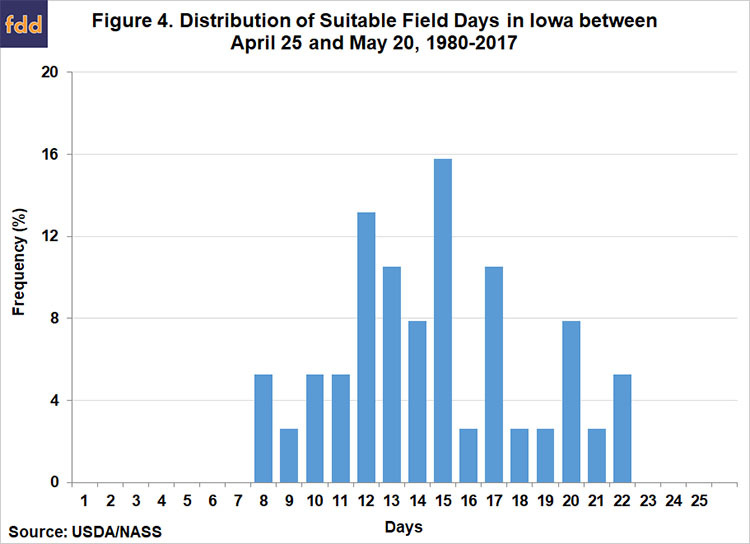 Over the 38-year period, the median number of suitable field days during this 25-day period was 13 days for Illinois and Indiana and 14 days for Iowa. In other words, farmers were normally able plant about half the time during this time window. The range of suitable days is very wide in each state, with a minimum of 6 days and a maximum of 24 days in Illinois, a minimum of 1 day and a maximum of 25 days in Indiana, and a minimum of 8 days and a maximum of 22 days in Iowa. Note that the chance of 18 or more suitable field days in this period is only about 20-25 percent. We can now put the four factors together that determine timeliness to project late planting for the 2018 U.S. corn crop. We know that only about 5 percent of the U.S. corn crop was planted as of April 25. Since zero late planting is rarely achieved, the chance of more than average late planting as of May 20 is probably a more meaningful computation. As noted above, the average amount of late planting is 18 percent, which implies a target of 82 percent of corn acreage planted on May 20, or 77 percent planted between April 25 and May 20 (82 – 5 percent). We next need to convert 77 percent planted into suitable field days. Assuming 14 days is the minimum number of suitable field days required to plant the corn crop, approximately 11 suitable days will be needed to achieve 77 percent planted in the April 25 to May 20 window. Consulting Figures 2-4 as a guide, there is about a 65 to 85 percent chance of achieving 11 suitable field days in the heart of the Corn Belt, which is likely a reasonable benchmark for the rest of the U.S. Once again, it is important to emphasize that this should be thought of as the best-case scenario because we are assuming that farmers can plant at peak rates for all 11 suitable field days. It is probably more reasonable to assume that it will actually take 13 to 15 suitable field days to achieve 77 percent of the corn crop planted between April 25 and May 20. 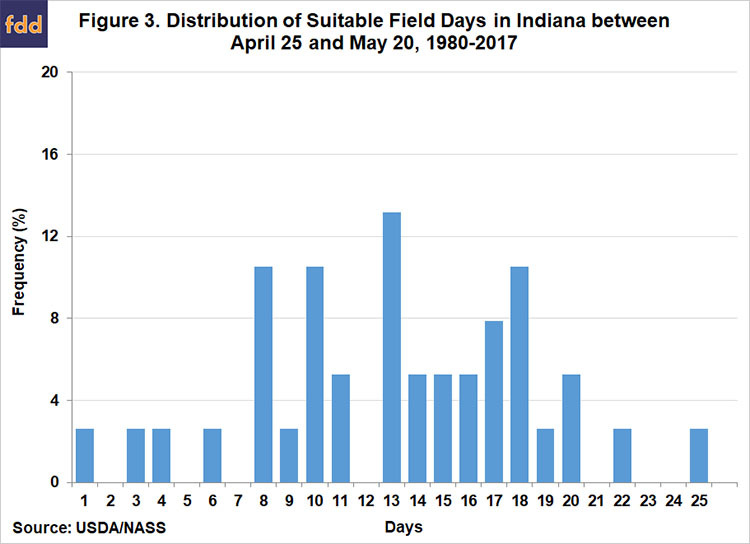 The chance of 15 suitable field days occurring in the 25 days drops to between about 40 and 50 percent, based on historical distributions for Illinois, Indiana, and Iowa. Overall, the computations here indicate that there is still sufficient time remaining to plant the 2018 U.S. corn crop in a timely manner. However, the same computations also indicate that the margin for error is slim due to the late start of the season. This is especially important because the computations are based on the historic distribution of suitable days for field work, which represents a wide range of conditions. The very unusual weather conditions in the Corn Belt to date this spring suggests some caution in projecting historical distributions. Soil temperatures are unusually low in the northern Corn Belt and conditions are very wet in much of the eastern Corn Belt and the mid-South. These conditions suggest further delays in planting that will likely result in a larger than average amount of corn acreage planted late compared to the historical average of 18 percent. We believe a reasonable estimate at this point is for late planting to be 5 to 10 percent above average. The final step of the analysis is to draw implications of late planting for projecting the national average corn yield. Since a number of factors influence the magnitude of the U.S. average corn yield in any given year, particularly summer weather conditions, it is necessary to estimate the impact of all relevant factors in order to quantify the impact of the timeliness of planting. This is typically done with a crop weather regression model that relates the U.S. average corn yield to factors such as trend, the percentage of the crop planted late, and an array of weather variables. In brief, based on observations from 1980 through 2017, we specified a crop weather model of the U.S. average corn yield with a linear time trend, late planting as shown in Figure 1, quadratic functions of June, July, and August precipitation, and linear functions of June, July, and August temperatures as explanatory variables. The weather variables are acreage weighted-averages for the Corn Belt. The model produces an estimate that the U.S. average corn yield is decreased by 0.254 bushels per acre for each percentage of the crop that is planted after May 20 and this coefficient is statistically significant. Consequently, the estimated yield impact of late planting that exceeds average is not trivial. As indicated in Figure 1, the percent of the U.S. corn crop planted after May 20 averaged 18 percent from 1980 through 2017. The coefficient estimate implies that for each 10 percentage points that late planting exceeds the average level the national average corn yield is reduced by about 2.5 bushels (10 X -0.254). In our webinar after the March 30 USDA reports, we presented a linear trend yield projection of the 2018 national average yield of 171.4 bushels per acre based on observations from 1960-2017. Our estimate of late planting in the range of 5 to 10 percent above average and the late planting coefficient from the crop weather model indicate this projection should drop by 1.25 to 2.5 bushels, or a range of 168.9 to 170.2 bushels. Adjusting other trend projections, such as the USDA’s 174 bushel per acre projection from the February 2018 Ag Outlook Forum, is straightforward and simply requires subtracting late planting impact of 1.25 to 2.5 bushels. In the case of the USDA’s estimate, the adjusted range is 171.5 to 172.8 bushels. Why is it that every corn agronomist known to man preaches about the importance of timely planting and yet the statewide statistical data suggest that planting date accounts for less than 25% of the variability in statewide yields from year to year?…It is true that relative grain yield potential of corn declines with delayed planting after about May 1…Yield potential goes down with delayed planting because of a number of factors, including a shorter growing season, greater insect & disease pressure, and higher risk of hot, dry conditions during pollination. However, the good news is that planting date is only one of many YIFs [yield influencing factors] for corn. 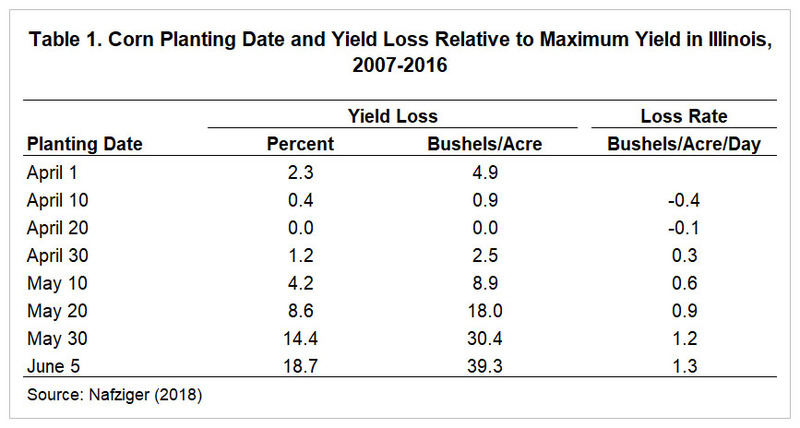 What is important to understand is that yield loss due to delayed planting is relative to the maximum possible yield in a given year. Professor Nielson also give examples of late planted crops with above-trend yields (2009) and early planted crops with below-trend U.S. yields (2012). The reason for such divergences is not surprising–July temperature and precipitation are typically the most important factors influencing the U.S. average corn yield (farmdoc daily, June 26, 2012). The late start to the 2018 corn planting season and continued cold soil temperatures in the northern Corn Belt and wet conditions in the eastern Corn Belt have led to concerns that much more than the average percentage of acreage will be planted late. Our computations indicate that there is still sufficient time remaining to plant the 2018 U.S. corn crop in a timely manner (before May 20). However, the same computations also indicate that the margin for error is slim due to the late start of the season. If we assume that 15 suitable field days are needed between April 25 and May 20 to plant the crop given current conditions, historical distributions for Illinois, Indiana, and Iowa indicate there is only about a 40 and 50 percent chance of this occurring. For this reason, we believe a reasonable estimate now for late corn planting in 2018 is 5 to 10 percent above average. The late planting coefficient from a crop weather model we estimated indicates this level of late planting would drop our linear trend yield projection for the U.S. of 171.4 bushels by 1.25 to 2.5 bushels, or a range of 168.9 to 170.2 bushels. The bottom-line is that despite the difficult conditions so far this spring it is too soon to lower corn yield projections much. However, this could change rapidly in coming weeks. Our analysis provides a useful benchmark for estimating late planting impacts if conditions deteriorate. Specifically, for each 10 percentage points that late planting (after May 20) is above average, projected national average corn yield is expected to decline by 2.54 bushels per acre. Irwin, S., and D. Good. "Where Should We Be Now With Corn Yield Expectations?" farmdoc daily (2):121, Department of Agricultural and Consumer Economics, University of Illinois at Urbana-Champaign, June 26, 2012. Irwin, S., D. Good, and J. Newton. "Early Planting and 2015 Corn Yield Prospects: How Much of an Increase?" farmdoc daily (5):93, Department of Agricultural and Consumer Economics, University of Illinois at Urbana-Champaign, May 20, 2015. Irwin, S., D. Good, and M. Tannura, "2009 Final Corn and Soybean Yield Forecasts." Marketing and Outlook Brief 2009-01, Department of Agricultural and Consumer Economics, University of Illinois at Urbana-Champaign, September 2009. Irwin, S. an T. Hubbs. "How Many Days Does It Take to Plant the U.S. Corn Crop?" farmdoc daily (8):70, Department of Agricultural and Consumer Economics, University of Illinois at Urbana-Champaign, April 19, 2018.